There is something this that reminds me of Whistler’s Mother! There is something about old doors and windows in towns of the Southwest. I can’t pass one by without bringing out my camera! On a side street in Albuquerque. I had never heard of Canyonlands in Southern Utah until our daughter, Caitlin and soon to be fiance and husband, Justin traveled there in the late 1990’s. In fact, I had never heard of Arches National Park or even Moab back then. When we traveled through Utah in 2014, we skipped Canyonlands, but this time we wanted to check it out while we were staying in Moab. What an incredible place- fantastic canyon views and without the crowds of the Grand Canyon! The above shots were taken through Mesa Arch, reached by a relatively short hike up and down over uneven ground (a challenge for my unstable knees) to reach this stupendous view. This is one of the most visited spots, so getting a view of the arch itself was almost impossible, because of all the tourists. It was almost midday and incredibly hot, but the views were worth the effort to get there. Since we moved to Arizona, I’ve wanted to visit Tucson’s famous Barrio Viejo, the historic district of quaint and VIBRANT old adobe buildings. We managed set aside a morning out of our anniversary trip last week to stroll through the area and take photos- MANY photos. 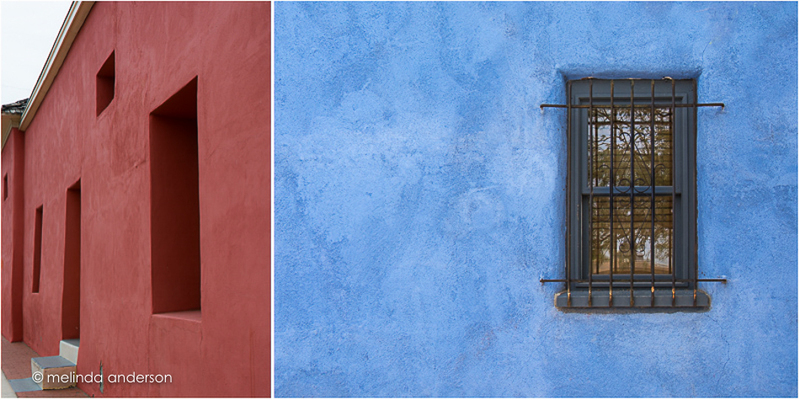 You will be seeing many more photos like the ones in this diptych in future posts!